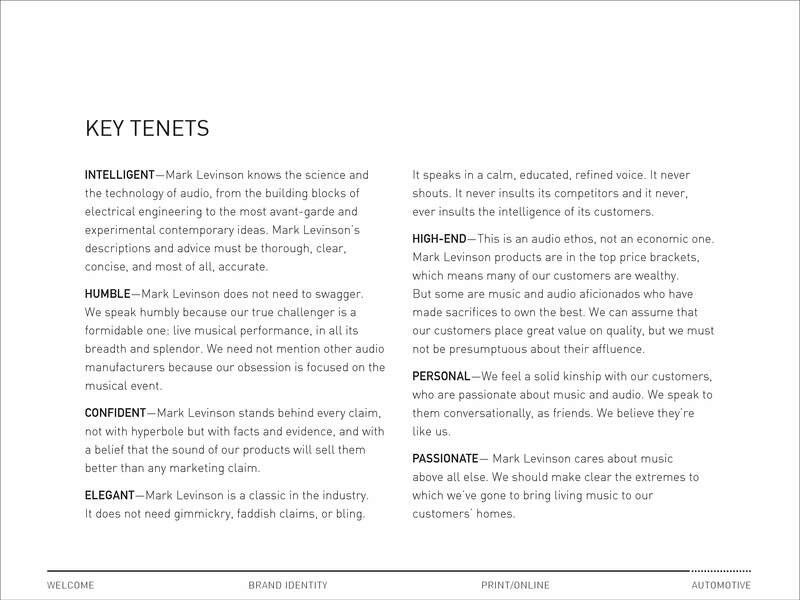 I was lead copywriter for Mark Levinson, through Stirred Creative, for six years. This is Harman International’s ultra high-end audiophile brand. 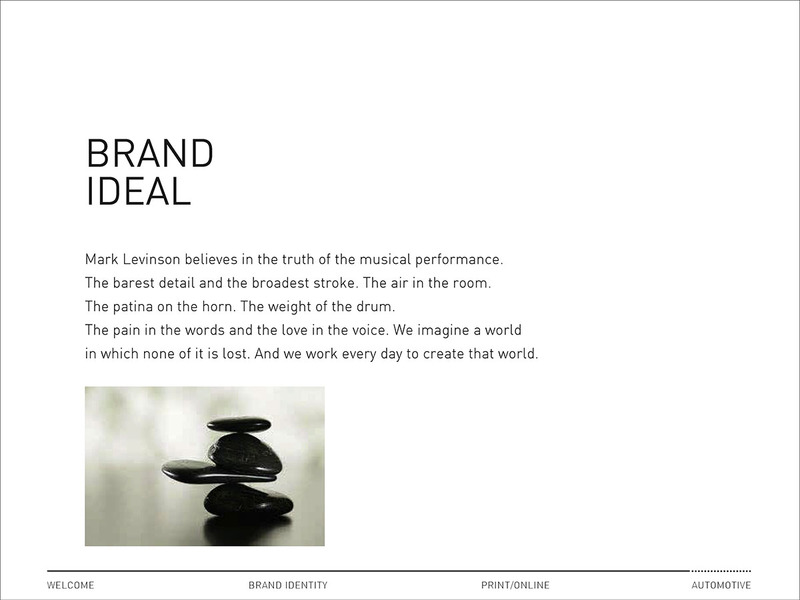 I was in charge of research, verbal strategy, and all the writing for the Mark Levinson Style Guide—basically everything besides visual identity. Mark Levinson believes in the truth of the musical performance. The barest detail and the broadest stroke. The air in the room. The patina on the horn. The weight of the drum. in which none of it is lost. And we work every day to create that world. 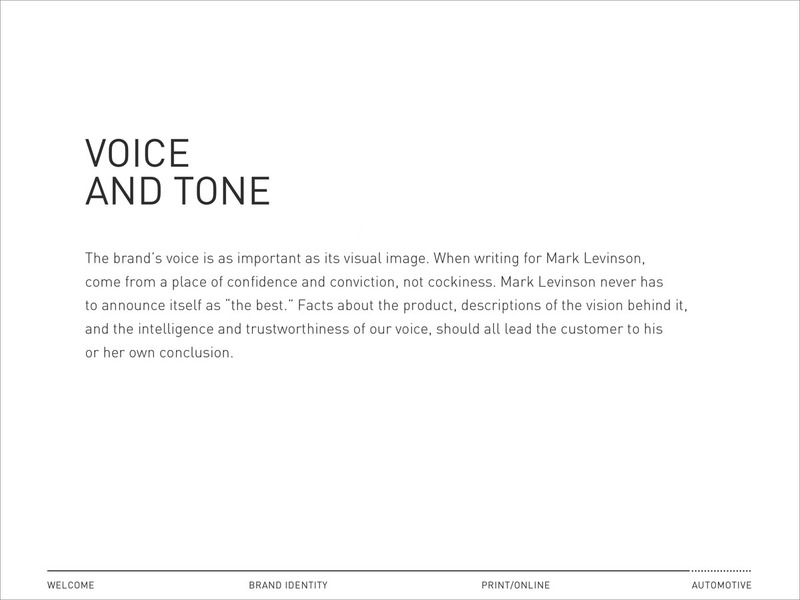 The brand’s voice is as important as its visual image. When writing for Mark Levinson, come from a place of confidence and conviction, not cockiness. Mark Levinson never has to announce itself as “the best.” Facts about the product, descriptions of the vision behind it, and the intelligence and trustworthiness of our voice, should all lead the customer to his or her own conclusion. INTELLIGENT—Mark Levinson knows the science and the technology of audio, from the building blocks of electrical engineering to the most avant-garde and experimental contemporary ideas. Mark Levinson’s descriptions and advice must be thorough, clear, concise, and most of all, accurate. HUMBLE—Mark Levinson does not need to swagger. We speak humbly because our true challenger is a formidable one: live musical performance, in all its breadth and splendor. We need not mention other audio manufacturers because our obsession is focused on the musical event. CONFIDENT—Mark Levinson stands behind every claim, not with hyperbole but with facts and evidence, and with a belief that the sound of our products will sell them better than any marketing claim. ELEGANT—Mark Levinson is a classic in the industry. It does not need gimmickry, faddish claims, or bling. It speaks in a calm, educated, refined voice. It never shouts. It never insults its competitors and it never, ever insults the intelligence of its customers. HIGH-END—This is an audio ethos, not an economic one. Mark Levinson products are in the top price brackets, which means many of our customers are wealthy. But some are music and audio aficionados who have made sacrifices to own the best. We can assume that our customers place great value on quality, but we must not be presumptuous about their affluence. PERSONAL—We feel a solid kinship with our customers, who are passionate about music and audio. We speak to them conversationally, as friends. We believe they’re like us. 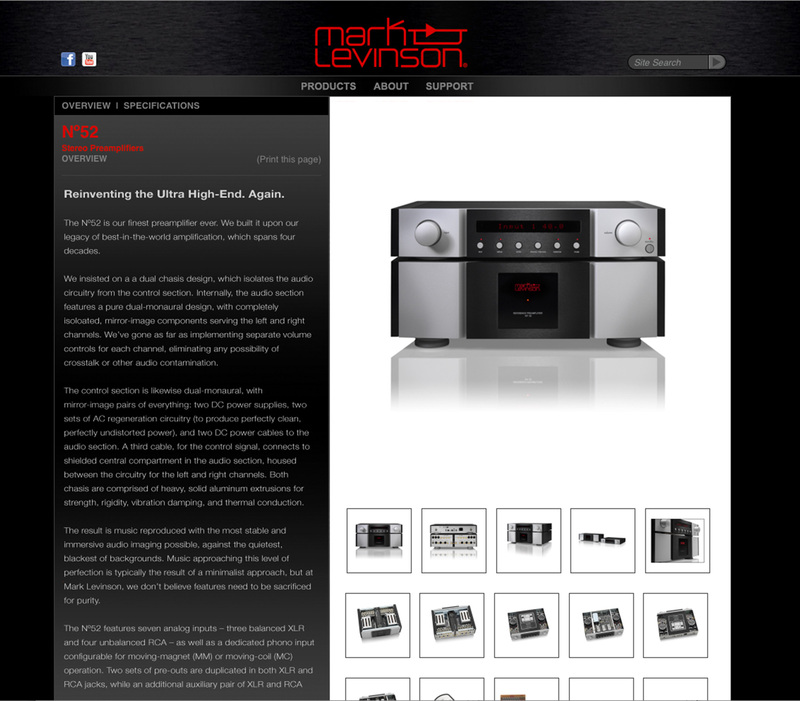 PASSIONATE—Mark Levinson cares about music above all else. We should make clear the extremes to which we’ve gone to bring living music to ourcustomers’ homes. Reinventing the Ultra High-End. Again. The Nº52 is our finest preamplifier ever. We built it upon our legacy of best-in-the-world amplification, which spans four decades. We insisted on a a dual chasis design, which isolates the audio circuitry from the control section. Internally, the audio section features a pure dual-monaural design, with completely isoloated, mirror-image components serving the left and right channels. We’ve gone as far as implementing separate volume controls for each channel, eliminating any possibility of crosstalk or other audio contamination. The control section is also dual-monaural, with mirror-image pairs of everything: two DC power supplies, two sets of AC regeneration circuitry (to produce perfectly clean, perfectly undistorted power), and two DC power cables to the audio section. A third cable, for the control signal, connects to a shielded central compartment in the audio section, housed between the circuitry for the left and right channels. Both chasis are comprised of heavy, solid aluminum extrusions for strength, rigidity, vibration damping, and thermal conduction. The result is music reproduced with the most stable and immersive audio imaging possible, against the quietest, blackest of backgrounds. Music approaching this level of purity often comes from a spartan, minimalist design. But at Mark Levinson, we don’t believe features need to be sacrificed for perfection.